This past March the Flagstaff Model RR Club was invited to participate in the Flagstaff Home & Garden Show at the NAU Skydome. For that show we displayed two personal layouts (one in N scale and the other S scale), as well as our HO scale Kids Layout. Bringing personal layouts to public events can be tricky and risky, so following the show it was suggested that we build an N scale sectional layout for the Club. The layout could be used for public shows, special events, visiting the children’s ward at the hospital, etc. Similar to the existing HO Kids Layout, the N layout could also be operated by the public under the supervision of Club members. 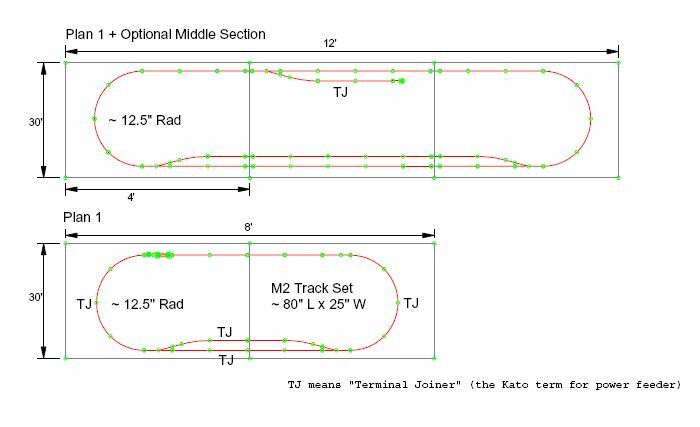 The layout design consists of a basic oval track plan with a passing track and stub siding, arranged across three modules in such a manner that the center module can be omitted for those times when the venue can’t accommodate the entire layout. Refer to the layout plan below, showing both configurations, with and without the center module. For ease of construction and sturdy design, the benchwork will use Sievers Benchwork components (www.sieversbenchwork.com), a modular benchwork system which includes various standard sizes of open-grid sections and legs. Each kit includes pre-cut and pre-drilled lumber, along with all the necessary hardware. Assembled with screws, it takes less than 30 minutes to assemble a module. The modules are then bolted to each other, making the system adaptable to any size or type of layout. For reliable track that will stand up to module setup and teardown, not to mention hauling around from place to place in the back of someone’s minivan, we will use Kato Unitrack (www.katousa.com), a sectional track system with built-in roadbed and an enormous variety of straights, curves, turnouts, crossings, and more. To get the layout up and running quickly, the initial project is limited to benchwork, trackwork, and electrical. The addition of structures, details, and scenery is not included at this time. It will be added later, either as the result of a new project proposal or perhaps as a learning vehicle to teach scenery and detailing techniques to newcomers to the hobby. Well that’s all I have for now. I have to get busy ordering track and benchwork so construction can begin over the holiday break. Check back again soon! – Phil S.